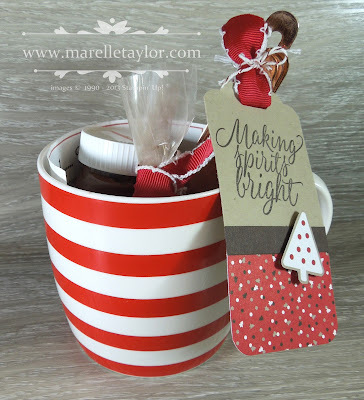 Marelle Taylor Stampin' Up! Demonstrator Sydney Australia: 3,2,1...Mug Cake! I have 12 simple Christmas gift ideas to share with you over the next few weeks, and they all involve a tag, made using the Tin of Tags stamp set -25% off this month! - and the Candy Cane Lane Christmas paper. I thought I would start off with my favourite gift idea - this Chocolate-Cake-in-a-Mug. I think it would make a great teacher gift, neighbour gift, or anyone-who-likes-chocolate gift! The mug and copper measuring spoons are from Kmart. I got the adorable mini Nutella jar from a fruit shop ('cos Nutella is sooo healthy! ...but I have been told that Kmart stock them too!). The resulting cake is so moist, and more brownie than cake-like, as it doesn't contain any eggs (let's face it, one whole egg for one mug cake is a LOT of egg!). I experimented with quite a few ratios before settling on this one (my kids were my very willing guinea pigs!). 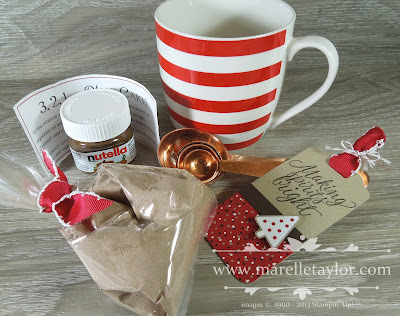 Feel free to use this gift idea...or just go make yourself a mug cake!